Staten Island is the least populated district of New York. It is also geographically the farthest from the city’s downtown area and has a reputation that leaves a lot to be desired. Tourists usually only come here because the free ferry from Manhattan offers beautiful views of the Statue of Liberty and the famous city skyline. But various new developments, some with a Dutch dimension, could provide the much-needed final push to encourage people to cross over to the island. One such development that Streetlife is contributing toward is the innovative Urby housing concept. With the arrival of the New York Wheel, engineered by a Dutch agency, along with a new outlet mall, tourists may no longer be tempted to board the first ferry back. But getting young, urban New Yorkers to move to the island may require a bit more persuading. Urby has been designed by the Amsterdam-based firm Concrete and is one of the first projects aiming to encourage contemporary urban residents to relocate to Staten Island. Key features include the striking architecture and, by New York standards, lavish outdoor spaces for leisure and relaxation. There is also a range of additional facilities, such as an urban farm, a swimming pool and the indispensable coffee bar, which has contributed to a unique 900-apartment complex targeted at young, urban professionals. The materials used and the layout of the site are in complete harmony with the general design concept. 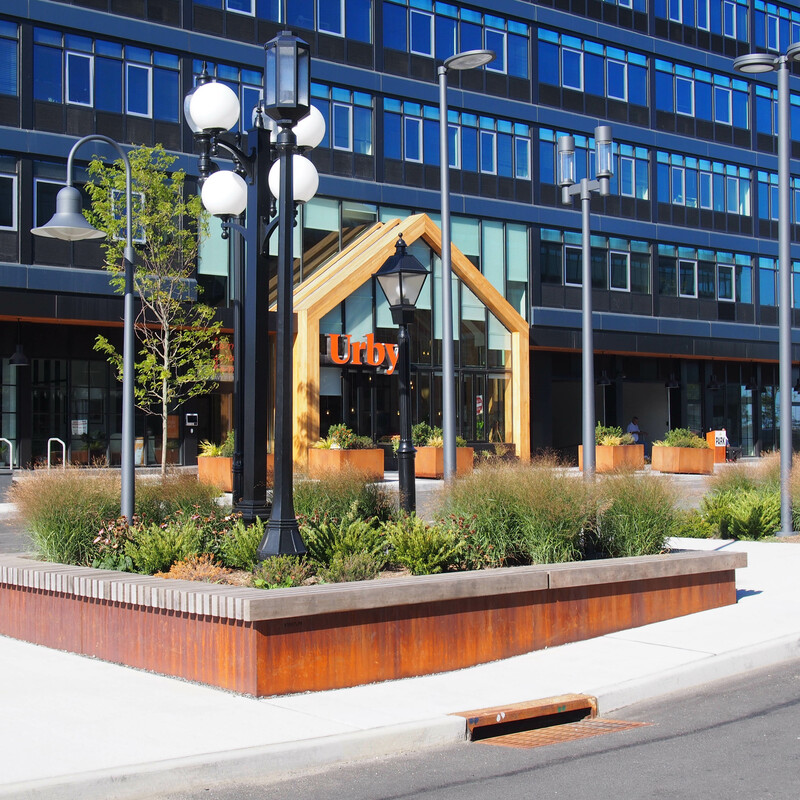 Natural greenery is used throughout and robust wood, CorTen steel and brightly colored details feature prominently. Streetlife’s landscaping elements possess a natural, minimal character and blend in perfectly. The combination of seating areas with generous amounts of lively greenery is a defining feature of the Streetlife approach. The customization options and the ability to produce in the US were decisive factors that led to Streetlife being selected for the project. As Streetlife was involved in the design process at an early stage, an optimal result could be achieved. The project team opted for items from the Rough&Ready (R&R) range, a product line characterized by the substantial beam size (7cm x 15cm). 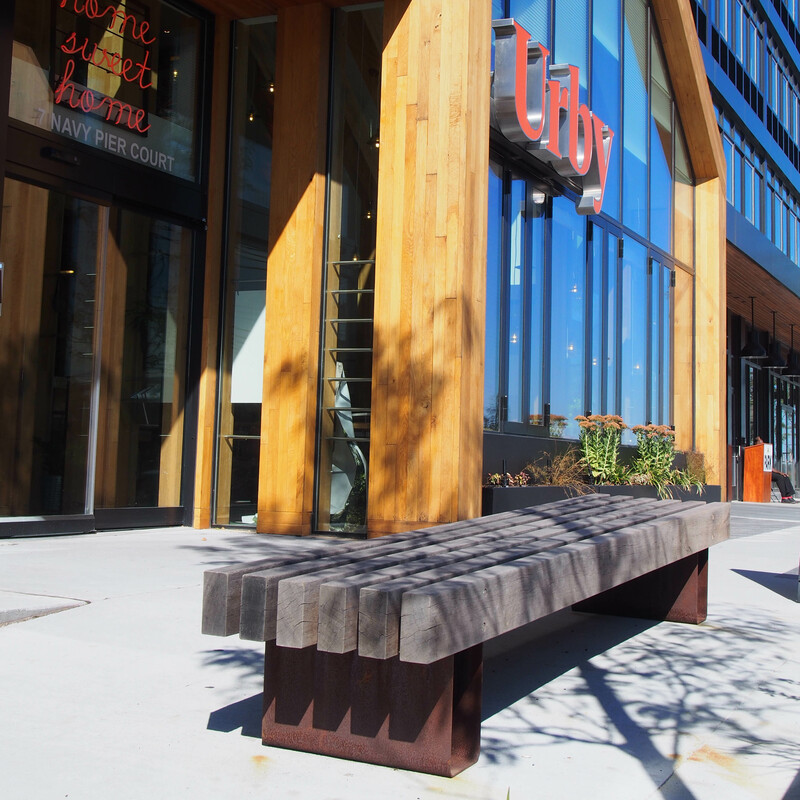 The sturdy appearance of the benches blends with the overall design of the buildings and the history of the location. 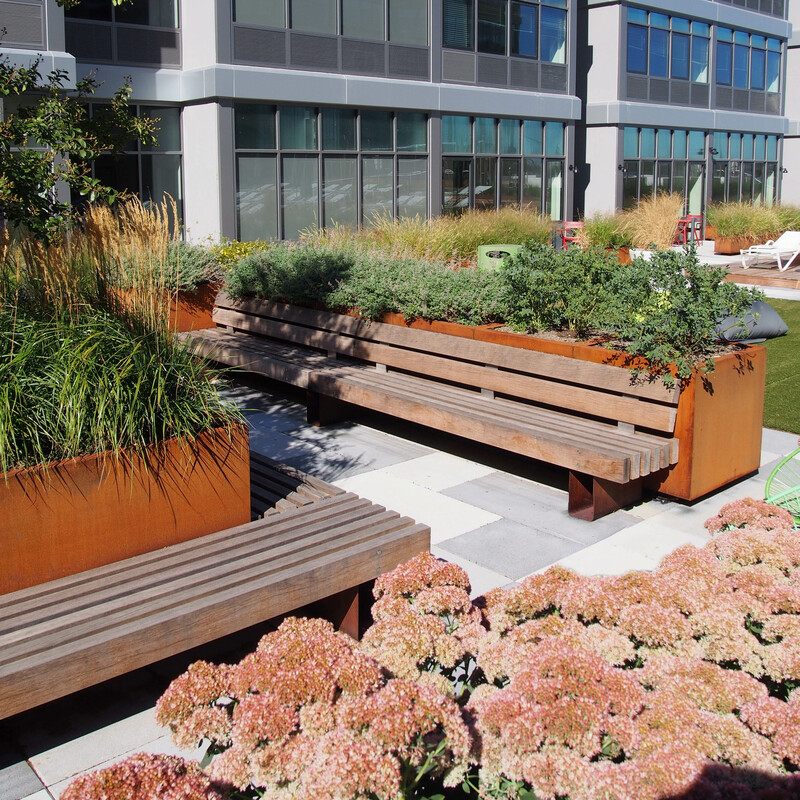 A square custom R&R tree isle has been installed in front of the first completed apartment complex, while in the courtyard gardens of the various buildings, several configurations of Streetlife’s R&R benches have been incorporated. On request, the R&R 6 benches have been equipped with extra-long backrests. This feature serves to further enhance the robust appearance of the seating modules. 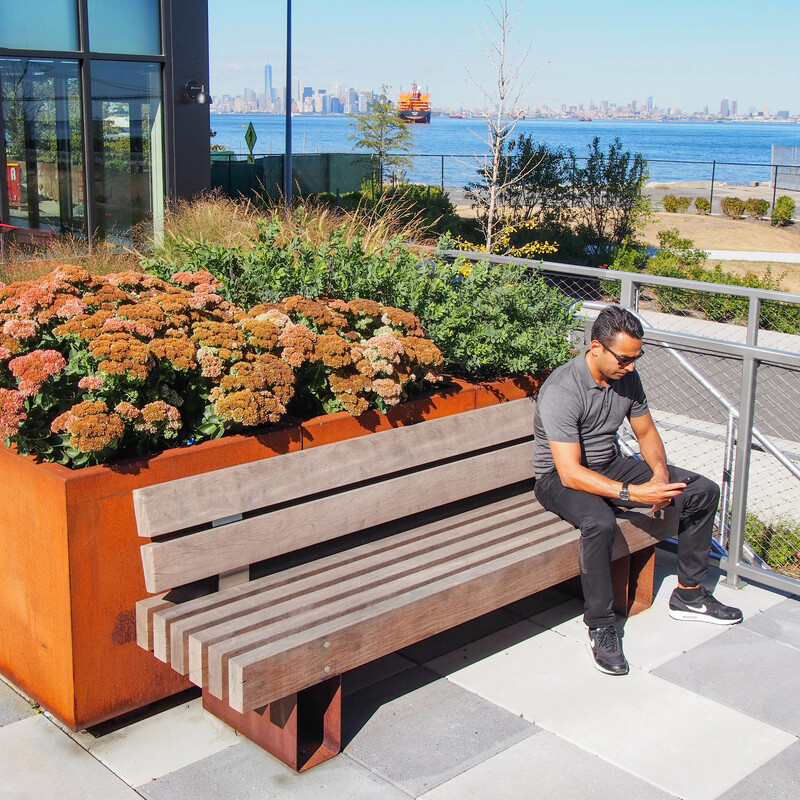 As the steel supports of the benches are made from CorTen, they harmonize nicely with the CorTen tree planters. Installing the R&R benches separate from the tree planters affords a certain level of freedom to vary the layout of the landscaping elements. In the communal garden, for instance, configurations that allow the benches to be placed against the CorTen steel tree planters create secluded places which provide a sense of security. The project has been based on a pleasant collaboration between Streetlife and the developer, architect and contractors. This has resulted in further ongoing collaborations on new projects within New York and the surrounding area.